We look into why your central nervous system won't regenerate and how it might be possible to make it do so. Simone - Well following spinal cord brain injury, nerves do not regenerate and this leads to disability which can be a really very, very severe and long lasting, potentially forever. Chris - But when someone injures say, their fingers or their arm in a horrible accident and has a body part re-attached, they do regain sensational movement in those parts don't they? Simone - That is right. There's a striking difference between the capacity of the limbs for example to regenerate the nerves and the spinal cord or the brain. And we are just now beginning to understand the fundamental reasons for this striking difference. What we did is to contribute to this understanding by identifying a way we can switch on the regenerative potential in the spinal cord and in the brain by learning how the limbs for example, are able to switch on their regenerative potential. Chris - Why do you think that the brain and spinal cord don't regenerate naturally, given that things like arms and legs can reconnect nerve cells if they're damaged? 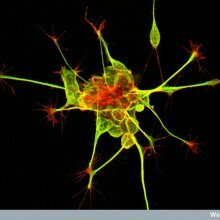 Why is that process purposefully disabled in the central nervous system? Simone - Well, this is a very interesting question that I get asked quite often and I do think that the main reason is because in our limbs, in our hands for example, the anatomical structure is so much more simple than what we have in the spinal cord and the brain that regeneration and regrowth can be successful while it's actually known that partial regeneration and regrowth in the spinal in the brain can lead to side effects like pain for example. So, maybe the system is not ready to do it by itself and we had to find a good way to help it out. Chris - So, talk us through the study in a bit more detail. What do genes turn on or off when nerve cells are injured and how does this alter or compare between nerves in your arms and legs and your spinal cord for example? Simone - There's a group of genes so-called 'regeneration associated genes' which are turned on in the periphery, let's say in the limbs, and they're not turned on in the spinal cord. What we have identified is a so-called 'epigenetic key factor' called pkaF which is responsible to switch on a number of these genes altogether and this is something quite special because with the one shot of gene therapy - if you allow me to say that - we can now switch on several genes which promote regrowth in their cells instead of having to do it one by one. Chris - Again, you've got this molecule, this pkaF molecule which can trigger nerve cells to want to regenerate - if I'm allowed to say 'want' - but the point is, what makes that pkaF turn on in a nerve in your arm or your leg, but not in the spinal cord? Simone - Yeah, there are specific signals which are transmitted from - a cut nerve for example in a leg and this signal starts what are called 'phosphorylation cascades', their biochemical chemical signals that tell pkaF to be turned on to promote the regeneration programme. These specific biochemical signals are silent within the spinal cord. Chris - And you have used gene therapy to put those signals into the spinal cord and when you do that, the nerve cells there behave as though they're in an arm or leg and they try and regrow when they're injured. Simone - It's almost correct. Let's say there are signals that activate this gene called pkaF which in turn activates regeneration programme. We, by gene therapy delivered pkaF which is in the middle between the signalling and that we activated this gene and now, we trigger regeneration programme. Chris - When you do this, what sort of level of regeneration or repair can you get in the brain and spinal cord. Is it a clinically relevant amount? If you're an injured person who is currently paralysed by their injury, would the amount of repair or regeneration you're getting in your studies in animals actually produce a meaningful benefit to that person? Simone - It's an impossible question to answer. So in principle, the answer is yes, but we had to perform and we're planning to perform specific studies to address whether this level of regeneration enhances recovery following spinal cord injury in mice and after we've done that, we can transfer that into humans, in patients. Chris - Simone, thank you very much. That's Simone DiGiovanni who is from Imperial College in London and he published that study in the last week or so, in Nature Communications. - Each case is different, but everyone on the spectrum shares three main areas of difficulty; social interaction, communication, and imagination or flexible thinking. - On the flip side people with ASD may exhibit common strengths with a focused attention to detail, an excellent memory, and a tendency to logical thinking. - Other common traits of ASD include a love of routines, sensory sensitivity in one of the five senses, and having intense special interests, topics that they enjoy talking about and engaging in over and over again. - However it's hard to characterise a condition which ranges from the one in ten people who cannot speak to those who are high functioning and have a milder form of Autism Spectrum Disorder. - ASD Symptoms typically start to develop in early childhood, but some people with milder forms are not diagnosed with the condition until adulthood. - In the past, some people believed that the vaccine for measles, mumps and rubella caused ASD. However further investigation showed that there is no link between the two, instead the age at which communication problems begin to appear in ASD patients is around the same age that the vaccine is given. - Genetics also seems to play a role in 90% of autism cases, with an increased risk of a baby developing the disorder if relatives have it. But it's likely that many genes are involved, possibly interacting with environmental factors. Chris - To outer space now, and Enceladus, one of Saturn's 62 moons. This one is important because it gives rise to what some people have dubbed "the biggest geyser in the galaxy". Not a big bloke. It's actually a periodic plume of salty water which jets thousands of kilometres out into space and even contributes to Saturn's ring system. Now, scientists think that they have pinpointed where this water is coming from. They think they've got evidence for giant internal ocean, which is deep within the moon. Madhu Sudhan is a lecturer at the institute of astronomy in Cambridge. And he's with us to tell us a bit more about it. Chris - What's powering that phenomenon though because to jet water thousands of kilometres into space takes a lot of energy? So, where's that energy coming from? Madhu - Recently, in the past 4 or so years, there have been recent studies suggesting that it's the tides caused by the planet Saturn itself and another moon in the system. The tidal energy is causing these vents to squeeze and open up as the moon is going around the planet. Chris - So, it gets a gravitational massage - for want of a better phrase - by Saturn and this causes friction to heat up the water. So, the water must be coming from somewhere. 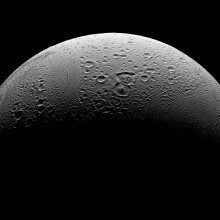 Is this just ice melting or do we think there actually is a big reservoir of water inside Enceladus? Madhu - So, that's where the latest study comes in, which basically points to the possibility that there's a big ocean in the southern side of the moon that lies 30 to 40 kilometres beneath the icy crust. The water layer itself is estimated to be about 10 kilometres in thickness. Chris - Gosh! That's a pretty deep ocean. I mean, that's on par with the deepest parts of Earth's oceans, isn't it? Chris - In a moon which is only about 500 kilometres across. It's so tiny, isn't it? Madhu - Yeah, in diameter. It's very small. Chris - How did they use Cassini to work out what's going on inside the moon to the depth of 30 or 40 kilometres where you can't see? Chris - Good grief! This probe is how far away from Earth? Madhu - This is about 1.4 billion kilometres away. Chris - Extraordinary, isn't it? So basically, by looking at how the gravitational field of the moon influences the flight of the spacecraft, you can work out what must be inside the moon, but just how much mass must be there? Madhu - The mass and the structure of the mass. So, a camera onboard the spacecraft itself has found a depression on the surface of the moon itself. So based on that, you can estimate what the gravity field should be. But they found that based on this Doppler Effect, they found there should be an additional source of gravity beyond what is inferred just from photographs basically. Chris - So, they don't know it's water, but putting all of the data together, the gravitational measurements, the fact there's water issuing periodically from these vents in the south pole, it only really fits with water. Madhu - It's not necessarily the vents itself. It's that, you need an extra source of gravity to explain the Doppler measurements and that has to come from a higher density than ice itself. Water fits the bill almost exactly. Chris - If you have got a source of water in this place and it's clearly warm water if it's expanding and blowing out into space like this, could that be potentially a home for something to live? Madhu - So, water is a very good candidate for astrobiology. So yes, that's why this moon is very interesting. So, the answer is yes. 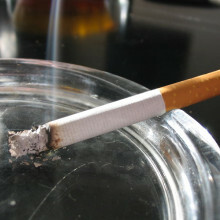 Kat - UK scientists have shown that fathers who started smoking before puberty producesons that are more likely to be overweight. Very confusing. Bristol researcher Marcus Pembrey led the study and he joins us now to explain more. What are you trying to find out that led to this study? Marcus - Well, we're basically interested in the possibility that some of our inheritance might go beyond the genome and be rooted in early life parental and ancestral experience, a sort of transgenerational response system. Kat - So, things that your parents do or your grandparents did are reflected in your own self then. Marcus - That's true. We were able to ask some questions along these lines. In the children of the '90s study in Bristol, this is the world's most comprehensive follow up in terms of detail of 14,000 children and thir mothers who were born in '91, '92. They were ascertained in pregnancy and of course, they're now 22, 23. In all that time, we've collected an enormous amount of information, genetics, measurements, diet, everything else. Kat - So tell me a bit about this particular link with smoking. So, who were you looking at what did you find? Marcus - Well, what we were trying to do was to test a hypothesis that was generated by some earlier Swedish studies that showed that period before puberty, mid-childhood was an exposure sensitive period with respect to these transgeneration effects down the male line, through the father. So, what we were doing was, we got information on when the fathers and the mothers actually started smoking. Although we had about 10,000 fathers responded, half of them had smoked at some time, 3% 166 had started before the age of 11. So, those are the ones we were interested in their offspring. Kat - So then, what did you find about the offspring of those particular dads? Marcus - Well, we analysed the boys and girls separately and we found that the sons, by the time they were in their teenage years - from 13 to 17 - had much larger BMI than the comparison group. The comparison group were all the others, the sons of fathers who started smoking after the age of 11 and also, the sons of fathers who didn't smoke at all. Kat - This does sound quite strange. What do you think is actually going on? Do you think that there's something else happening that's influencing this or is it some kind of effect of the chemicals in the cigarette smoke at that group of time? Marcus - Well, there are about 2,000 chemicals in cigarette smoke, so we don't know, but we know it has a big biological effect, smoking. It seems that something is being transmitted through the reproductive system. The exposure before puberty gets under the skin in some way in endures. It affects the reproductive system, probably carried by sperm to the son, but could be - I don't know - through the seminal fluid. In humans, we don't know what the mechanism is. Kat - Thanks very much. That's Marcus Pembrey whose research is published in the European Journal of Human Genetics this week. Chris - Crunch time now for cereals because scientists have discovered that when the characters portrayed on cereal boxes make eye contact with you, people are much more likely to buy the product. And while adult-focused cereals tend to show the characters looking straight ahead, the more sugar rich cereals which are targeted at kids, more normally, it turns out, look downwards which will meet a small child's eye line when they're walking around the supermarket. 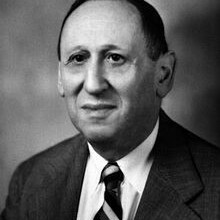 Cornell University's Aner Tal is one of the researchers behind the work. Chris - Tell us first of all, why did you decide to look at this? 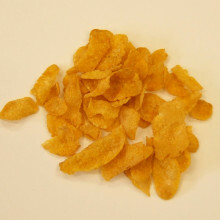 Aner - Well, growing up, I feel personally I had a sort of connection that I felt to Cap'n Crunch in particular and maybe that part of me wanted to know why that might be. And also, we noticed just going around grocery stores that a lot of the times, the cereals that are targeted towards children are looking down. So, that made us wondering, could it be that in addition to looking down at something on the package, they're also looking down at people crossing the aisle. Chris - So, how did you then begin to explore how many packets were doing this and whether this was a general phenomenon and also, what impact it has on potential purchases? Aner - So, we visited 10 grocery stores in Connecticut and New York states and we looked at about 65 cereals. 45 of those are targeted towards children and 20, not particularly targeted towards children and then we analysed the level of inflection of the eyes on these cereals. So, there are all cereals that had these box characters. What we found is that, for cereals that were targeted towards children, the angle of the pupils in the eye was directed downwards on average, to a level of about 9.6 degrees downwards. And that means that if you were a couple of feet into the aisle where children would be crossing, that a lot of the cereals are designed so that they're creating eye contact with kids. Now, we're not saying that this is a deliberate strategy. It might be completely incidental because if you look at the packages, a lot of the times, what these characters are doing are actually looking at their bowls of cereal. But it also happens that because of the angle they're looking at, they might be creating eye contact with kids crossing the aisle. Chris - How do you know? How did you investigate what impact that line of sight might have on a potential purchaser? Aner - So, to follow that research, after we looked at the angles and how the angles are different between adults and kid cereals, we ran a lab study where we gave half of our participants a picture of a Trix cereal that has a rabbit on it that creates eye contact with them. We used just Photoshop to move the pupils around and the other half of the participants saw a box of cereal that, where the eyes, the pupils weren't directed at them. We found that for people who were exposed to the cereal creating eye contact, they said that they felt more trust towards the brand, that they felt more connected to the brand. And also, when given a choice between that and a competing brand, Fruity Pebbles which is a similar cereal and flavour, they chose it more. So, 61% of the eye contact participants chose it versus 48% of the no-eye contact participants. Chris - Now obviously, we don't know whether manufacturers have already stumbled upon this and that's why they're using it. So, we can't speculate on that. Obviously, what you could do is to use your finding for good because one could argue, we could start using the same strategy on more healthy options to encourage more young purchasers to influence their parents even to buy healthier foods in the future. Aner - Exactly. So, as I've said, it might be that eye contact is incidental, but now that we know what it does, we can use that to promote healthier choices. So, a lot of the healthier cereals that are say, whole grain or don't have as much sugar, aren't specifically targeted towards kids. But if we start featuring box characters on those that similarly create eye contact, maybe we'll promote more positive feelings in children towards those cereals. And then maybe a child crossing the aisle would say, "Hey, I want that high fibre brand cereal versus the sugary Cap'n Crunch or Fruity Pebbles." What a battery is and how do they work? Chris - What actually is a battery? How does it work? Fiona - So, a battery is electrochemical device. So, it converts chemical energy into more useful electrical energy and it does this via oxidation and reduction reactions which involve the loss and gain of electrons respectively, which then go around the external circuit to then produce electricity. The three main components to make this happen, you need to have 2 electrodes - the cathode, the anode, and you need an electrolyte which is ionically conductive, so that the ion or the charged species can be transported. 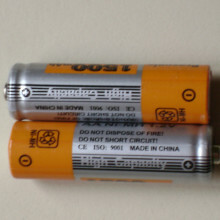 Chris - So, when I look at a battery which I might pick up from the supermarket or take out from my alarm clock, if I were to open one up, what would I see inside? Fiona - One of the classic examples to look at is one that's used in most laptops, phones, tablets at the moment, developed by Sony in 1990. It uses graphite as the anode, so it's got carbon. Chris - It's a carbon like a pencil lead actually. Fiona - Exactly, which has the sheets of carbon, which the lithium get intercalated or inserted in-between these sheets of carbon. In the cathodes, you've got a material called lithium cobalt oxide which has a similar layered structure to graphite but instead of carbon, it's cobalt dioxide. And then the lithium is in-between these sheets. Chris - Does that make the power though? Fiona - So then, the cobalt is in a 3 plus charge state and then it can go to the plus 4 then the lithium ion then goes across the electrolyte and it goes into the graphite while the electron goes around the external circuit then they recombine. And that's how you get your electricity. Chris - So, once all the lithium has made that journey, that's when the energy is spent from the battery. Fiona - That was in the discharge state. That was actually charging the battery and then to use it, the reverse process happens. 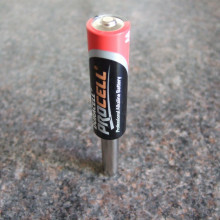 So, this is a rechargeable battery. So, the lithium ions can then rock back and forth because now, the cobalt 4 plus could go to the cobalt 3 plus state then the lithium goes from the intercalated graphite sheets, goes across the electrolyte into cobalt dioxide layers, and the electron goes around the external circuit. So, it was called the rocking chair battery because the lithium rocks back and forth. You can think of it like a Victoria sponge with the two layers of cake as the sheets of cobalt oxide, the jam of lithium inside. Chris - I love the analogy. I wouldn't like to eat a battery though. There's lots of very toxic things in it. Fiona - Yeah, I wouldn't advice it. Chris - Shall we build one? Fiona - Yeah. So, what we make in the lab is called a coin cell battery or button battery which is used in a lot of watches, phones, clocks. Chris - The little thing, they look a bit like a coin, don't they? Fiona - Yeah, exactly. So, you've got the stainless steel base and Chris, you can have a go at making one. Chris - It's like a little saucer, isn't it? Fiona - Exactly. So, just to proove how easy it is and then we've got our cathode material which is a lithium cobalt oxide which we have as just a piece of paper today. Chris - That would sit inside the base, just against the base. Fiona - Exactly. But then you need to have this rubber gasket sat inside the base because you can't have an electrical contact between the anode and a cathode or else it would be a short circuit. Chris - It's a short circuit inside the battery, wouldn't it? Yeah, okay. Chris - So, I've got my gasket. So, I basically got little cup like a stainless steel cup and I've got my chemical in the bottom that's the lithium cobalt oxide that's going to be one source of the charge. Now, I've put a rubber disk in there to separate it. Then what do I put in next? Chris - Okay, that's now a little sort of disk that goes on on top of the sandwich. Fiona - Exactly and then the top of our battery which is a kind of like another saucer like the base. Chris - And just plugs inside. Fiona - This coins cell battery, you can think of it as a AA battery or AAA by just rolling your sheets of anode, cathode and electrolyte, and then place in a cylindrical case. 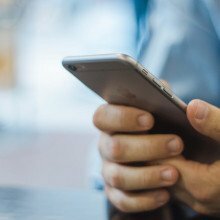 26:49 - Should you charge a phone when it is new? Is it okay to use a new phone straight from the box, or should you charge it up first? 29:30 - Charging from mains or USB? 30:05 - Do batteries hold less charge as they age? Chris - When I was in Chicago recently, I met up with a group at Argonne National Laboratory who are spending 100 million dollars over the next 5 years to make batteries that they say should be - if they had the money, 5 times better than the present generation. George Crabtree and Jeff Chamberlain are leading the project. George - We need new batteries for the transformation of the two of the most important energy sectors: transportation and the electricity group. Transportation is obvious. It's to electric cars, replace gasoline engines. In the case of the grid, it's to enable renewable wind and solar energy to be deployed at a high level, say, 20 or 30%. These are variable sources and you need a backup for them. Chris - Jeff, what's wrong with the batteries we have at the moment to fulfil both of those tasks that George has outlined? Jeff - So, the batteries we have at a moment, lithium ion are the best batteries out there for transportation and actually, for the grid. However, we need batteries that are significantly smaller, lighter, less expensive, recyclable, using Earth-abundant materials. So, we need to advance the technology, not just beyond where we are today with lithium ion, but even if you go as far as you can go with lithium ion, it won't meet the challenges that George has outlined. Chris - Pretty high aspirations. Can you achieve this? George - We're looking to be transformative and less than say, 5 times the performance at 1/5 the cost will not be transformative. The second answer is that it's well within what science will allow. So, if you take the back of an envelope and a pencil and ask, "What's the best I could do?" 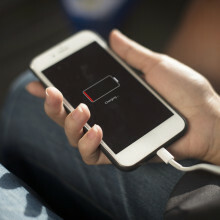 It's a factor of 10 and technology in the energy sector typically delivers half as a theoretical potential and that's true of lithium ion batteries for example. Chris - So, what approach are you taking Jeff, to try to explore how to build these better batteries? Jeff - It's a materials challenge, developing new active materials down to the nano or meso scale as well as the engineering challenge of how to put those materials into a chemical system that functions as a battery. So, our approach is to couple those two approaches in a highly interactive way so that while the science is occurring to discover and develop new materials, we're actually putting them in cells and connecting our cells directly with industrial partners to try to expedite that entire innovation timeline. Chris - So George, how did you go about developing a new battery? Is it literary loads of wet chemistry you're fiddling with chemicals in the laboratory and seeing if they work together or is there a strong theoretical arm to it? George - So, the typical way the R&D community operates now is, "I would like to have a better cathode. Give me one. I'll try it. If it works, I'll use it. If it doesn't work, I'll throw it away and try something else." But they will not ask the question, "Why did it fail?" or "Why did it work?" And that's the question that we want to ask. So, we're very different from typical battery R&D in this sense. We'd like to understand the phenomena and the materials of energy storage at the atomic and molecular level. And we feel that once we have that fundamental basic understanding, we'll be able to design rather than discover by chance. But actually, design the materials and the phenomena that we want in our next generation batteries. Chris - It's quite interesting that you're taking that fundamental, "We want to understand" approach and then asking, how do we use that to inform the development rather than just going hell for leather saying, "I need a better battery. Let's just try lots of things." George - Well, the typical community today actually does everything by serendipity. "I found something. It works. I'm finished." We want to take that to the next level and our feeling is that as we were saying earlier, that beyond lithium ion space is rich with opportunities. So, once you understand why phenomena work and how the materials operate, you can then design more than one solution to the battery challenge. There may be two or three solutions that are equally, let's say, appealing but for various different applications. Chris - We're returning to the question which was how are you actually going about it, to what extent is it theoretical and driven on the computer and to what extent are you actually getting your hands dirty with different mixtures of chemicals? George - So, on the very basic side of the spectrum of research that's performed in the centre, we do combine computation and experiment. We've created, actually launched in a beta test format inside the centre, something we call 'the electrolyte genome'. The idea is to take a somewhat genomic approach to developing a new chapter in the book of knowledge if you want to think of it that way, and how electrolytes function. 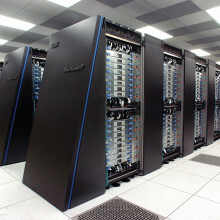 We do that using supercomputers that launch Brooklyn National Lab and here at Argonne National Laboratory. So, in a sense, we can explore with our deep understanding of the quantum chemistry. We're going to explore new molecules computationally. We couple that with experiments done all the way from vacuum phase, truly looking at individual molecules and a single crystal of metal, all the way to putting it inside of cells and monitoring its performance and testing, real time, the degradation or the function of those materials as we build them. So, the idea here is again, to combine the deep science with the engineering, but coupling that in a very hard way with a new way to compute and look for in a database, new discovery of new materials rather than a more hunt and peck method of developing materials in the lab. Chris - That must save an enormous amount of effort because you can try things in the computer which if they're going to draw a blank there saves you than having to go and discover that by making the system in a real world. George - That's the whole idea that will save an enormous amount of effort by using the computer to look at thousands or tens of thousands of things that might take decades to do experimentally. Chris - George Crabtree and Jeff Chamberlain. They're both from Argonne National Laboratory. 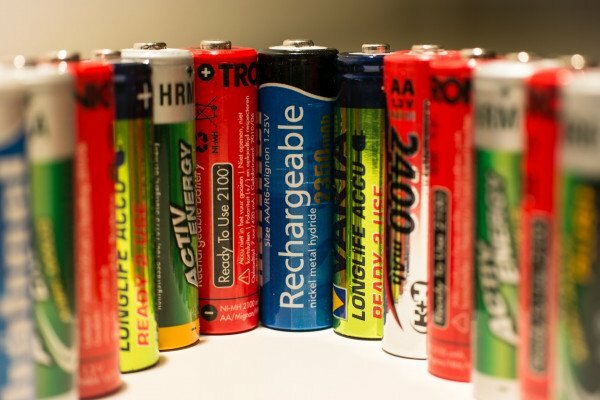 37:38 - Have rechargeable batteries got better? Have rechargeable batteries got better? Kat - I think most of that is me actually, old batteries. Graham - If I were to sell you a car and say it's going to cost you 80 pounds to fill it up with fuel, but every time you fill up again, it's going to cost you 50P for the next 300 fills. You think that's crazy. Why wouldn't I do that? And yet, with batteries, we don't. Kat - Is it just the chemistry of the batteries that's changed that enables them to be better? Graham - The chemistry has moved on. It started with NiCad, it's now nickel metal hydride and yes, it's very, very different today from what it was 10, 15 years ago. 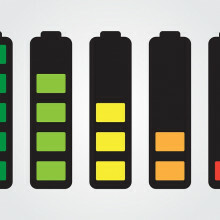 How we can change the lithium ion batteries in your phone or laptop to make them hold more energy. Clare - We're looking at the diversity of different approaches of which one of them is lithium and I think the reason why it's lithium is that lithium is the lightest element. It's one of the most reactive elements and so that, in principle gives you the highest voltage from the material. There's also a massive industry associated with lithium and so, it's quite important to actually work on the technology we have and improve what we have got. Why am I doing it? So, if you take the material that's in your laptop, most of the laptops contain this material lithium cobalt oxide. It turns out that you can only pull out 50% of the lithium out of lithium cobalt oxide before 2 things happen. First of all, if you put all of the lithiums out, you get structural rearrangements. And so, what happens is the layers slip over each other and then it becomes very difficult to put those lithium back in again. And so, that means that you actually have to keep some of the lithium in those structure. You can't pull them all out. And so, we're carrying around 50% of dead weight in this lithium cobalt oxide that we can't use. And so, if we can figure out how we can make other layered materials cycle. So charge and discharge, pulling out all of the lithium, we would have a battery that would almost be twice as effective. So, that's reason number one. Reason number two is that lithium cobalt oxide, when you pull all the lithiums out, forms all cobalt 4 plus. Cobalt 4 plus is not a very stable oxidation state and it tends to lose oxygen. And so, it's this loss of oxygen, very rapidly associated also with heating and self-discharging that results in the safety instance and the fires that you may have seen on the web. And so, for safety reasons again, we only pull out 50% of the lithium. So, you've got this idea of the fact that you've got a fact of two just sitting in the materials we used today. If we could get that to work, that's the difference between a car which has a range of 100 kilometres going twice as far. Kate - If you're sticking with lithium because that's what we got. That's the business model that we got laid out, what other aspects of a battery could you possibly change to improve its performance? Clare - Well, just going back to this idea of approving the electrodes themselves and we talked about lithium cobalt oxide. So there are materials out there where people replace the cobalt with nickel and manganese. And those, instead of having 140 milliampers per gram of charge, so that's just how many electrons can you get per unit of weight, they can allow you to cycle up to 200 and 220 milliampers per gram. So, that's a significant improvement. Then on the anode side, a few could find materials that stored more lithium and the anode that would help. One of the materials for example that we're looking at is silicon. So, silicon allows you to store 10 times more lithium per amount of weight. And so, that's very exciting. At the same time going back to the cathode, you can increase the capacity, but you can also go up in voltage to increase the overall energy density. Now, the trade off with that is safety, The higher voltage, the more oxidising things become and increased risks there. But people are looking at trying to coat electromaterials and protect them in the same way that you might - you think about metal in the environment. You have a passivating coating on the copper on a church. And similar things, we're trying to coat the materials to protect them from these very harsh oxidising environments. Kate - You've just mentioned a lot of different options. How do you go about testing the effectiveness of all the different options? Do you have to build this battery and how do you decide which materials to test out first? Clare - So, there's been a lot of work using theoretical methodologies. You can take a structure now at this point and you can use first principle methods to actually calculate the voltage of the material. The challenge is actually to calculate the difficulty of pulling the lithiums out of the structure because the lithium has got to move through different holes. As they jump from site to site, there might be large activation barriers associated with that. in other words, you've got to supply additional energy to get it out. And we would supply that additional energy in a battery in the form of what's known as an over potential. So, a little bit of extra voltage to kick it out and that's inefficient fuel battery. So, those are some of the challenges associated using computations. So, what we would do as chemists, there are people who'd go into the lab and make new materials. So, one of the things that we're going for was instead of just taking cobalt 3 plus to 4 plus, we want to try and find elements where we can change the oxidisation state by more than one. So, we could nickel 2 plus to nickel 4 plus. At the same time, we need to be able to pull the lithiums out. So simply, if we're going to do a 2 plus to 4 plus, we need 2 lithiums. So, we can go in to the lab with those sort of design criteria and try and make materials that might fit that. Kate - What are the limits on how much you're able to improve these batteries? Clare - So, I think one thing that's important to remember is that if you have a material that's made up of atoms and ions, and there are only certain number of electrons that you can pull out per ion that you have in your material. So, if you have nickel, the chances are, you're only going to be able to oxidise between 2 plus and 4 plus. And so, the point is, for a unit mass of material, there were only so many numbers of electrons and that puts a fundamental limit in where we're going to go. And so, we can play games and we can find lighter materials, we can use a wider range of oxidation state, but there's a fundamental limit to what we're going to be able to do and I think people do need to recognise that in terms of how we move forward in terms of developing strategies for electrification or for designing of new devices. Kat - Kate Lamble talking to Clare Grey from the University of Cambridge about her work. Chris - So Chris, why on Earth, but why have you done this? Chris H. - Well, because it seem like an interesting challenge really where my lab were interested in studying photosynthesis and you can think of photosynthesis as using tiny little electric circuits inside plants and algal cells which are powered by the sun. And so, you ought to be able to tap into that and get a small amount of electricity out. So, it's like a kind of photovoltaic cell, but using plants or algae instead of silicon. Chris - Paolo, how does it work? Paolo - Well, okay first of all, believe it or not, we got this little garden in the studio and if anyone want to see it, I would suggest to going in youtube and look for Moss FM. In that respect, I need to acknowledge that the person who actually created this is a designer called Fabian Felter. So moving back to the difficult question, how it works, thanks to Fiona, we got an idea how a battery is made. Actually, in some very similar way, this system operates in a sense that we got an anode made by carbon and a cathode made by carbon again, but with nanoparticle of platinum that acts as a catalyst. The photosynthetic organism is mostly harnessing the energy of the light and using it for something that is called water photolysis. So, that means it's breaking water to form oxygen and we all enjoy the oxygen generated by moss and other plants and also, protons and electrons. Electrons can travel around an external circuit and protons that are positive charges travel through the internal path from the anode to the cathode and be recombined on the surface of the cathode that's the catalyst. Chris - So, just looking at this, we've got lots of little pots of moss growing, all with crocodile clips attached to things coming out of the pots. That presumably is attached to the electrodes on which the moss is growing. So, that's collecting the current from each of the moss cells if you like, the batteries and directing it - how do you store or collect the energy, Chris? Chris H. - So, we can do different things. We can use it directly and so, we can for example use it to power little digital clock if we want to or an environment sensor. Chris - What's the voltage of a moss? How much potential difference does it produce? Paolo - Between 400 to 500 millivolts and this dependent of the radius potential of the system that donate electrons on the anodic side and the potential of the cathodic side, something that has been discussed through this programme. Chris - 400 millivolts, that's pretty good. That's half a volt. Paolo - As a matter of fact, this small garden is made by 10 pots and overall, we got around 4 volts because they are all connected in a series. Chris H. - But it doesn't mean you're not going to get electrocuted when you're out in the garden spiking the lawns. Chris H. - Don't worry. Chris - Can we have a go with it? Paolo - Yeah, definitely. I think we can try to power a radio. Chris - It would be fun if we can tune in to our own programme. Paolo - Okay, I think everything is connected. Chris - Well, that's an improvement on this programme. It sounds much better. Chris H. - I think we've doubled the listening figures. Chris - Well, it's certainly working. There's a little red light on and there is some static coming out from the speaker but I don't think the content is quite up to scratch. Chris - We just turn it down very slightly so we can hear what you're going to say. Normally, you would be picking up a radio or something. Paolo - Yes, we do. Chris - So, we'll put it down to there being some kind of shielding in this building. There's a lot of metal around here, so it could be blocking the signals. But that's actually working. That's producing quite a lot of noise. Paolo - Yeah, at least it's noise. Chris - Chris, could we use this sort of - this is a demonstration, but could we use this more broadly to actually do useful things and power useful gadgets in the environment using this technology? Chris H. - I think in the right kind of setting then you might be able to exploit this. So particularly, we're interested in situations where there isn't a good power supply so you might be thinking of rural areas where in Africa maybe or possibly refugee camps. Lots of possibilities where just a small amount of power can make a big difference. Chris - Just moss or will any plant do this? Chris H. - Lots of plants will do it. This is just moss off the bike shed roof in the biochemistry department and nothing fancy about it. Chris - Thank you very much, Paolo Bombelli and Chris Howe from the Biochemistry Department of Cambridge University. 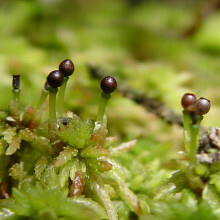 Is that the world's first moss-powered radio? Probably is, isn't it? Chris H. - I think it probably is, but somebody out there will probably correct us. Chris - If you're no different, let us know. 49:59 - Why does my computer need gigabytes of data just to run and operating system, but my DNA runs a whole body? Why does my computer need gigabytes of data just to run and operating system, but my DNA runs a whole body? Hannah - Does a computer need more data storage than human DNA? Surely, our processing power is greater. To get to grips with the answer, Dr. Nick Goldman from the Wellcome Trust Genome campus in Cambridge. Nick - The genome makes a machine which is brilliant at learning and then all your rest of your life experiences distilled into your brain or how you do all the things you actually do. So partly, the reason why a genome could be small compared to the amazing complexity of the final product, which let's say is an adult, is because DNA and the genome is a brilliantly clever way of storing the instructions to make a fantastic machine. The baby can't do very much, but it has an unbelievable capacity to learn. But that's not in your genome. Although the experiences you have are not in the genome, the system for storing them and making sense of them, it's in the brain. The brain is a machine and the blueprint for that machine is the genome. Hannah - Clever us with our human genome coding for our clever brains which contain a whopping 100 billion nerve cells with new connections forming between these nerve cells as we learn new things. Okay, so with that one figured out, what exactly is a computer's operating system? What does this do and how does it compare to our genome? Nick - The average computer doesn't contain in it the instructions for making a computer. They don't ship you a blueprint for the machine. They give you a basic set of software, an operating system that tells it how to do the most fundamental task. So, it's not the blueprint of the body which would be the genome analogy. It's instructions of how to do certain tasks, not how to make the machine. Hannah - Thanks, Nick and on Facebook, (Peka Olinker) and (Tony Spencer) agree, also adding that the DNA code has had about 3.6 billion years to evolve to efficiently store information for the blueprint of life. The first type of processing unit or brain was thought to have evolved around 400 million years ago in arthropods. And in fact, Dr. Nick Goldman has recently used genetic code of DNA as a storage method for data. 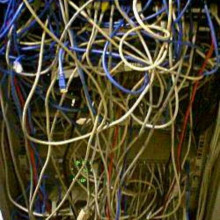 It was super efficient, much more so than the current binary system used for storing data on computers.